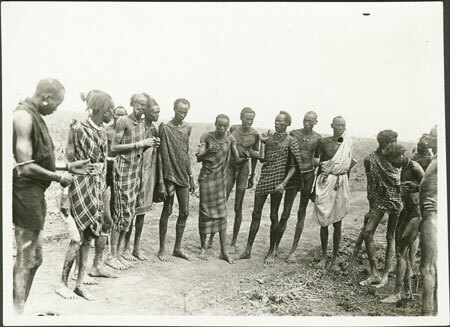 A group of men standing together in a rough semi-circle dressed in textile cloth which they have tied over one shoulder. Two of the men are gesticulating as they speak to the others, one with thiau arm rings. The group is described as a group of lou chiefs in council, probably meaning that they are the leading men of a particular community of the Nuer Lou since the Nuer do not have tribal chiefs in this sense. The photograph seems to have originated from Talib Ismail, a sub-mamur at Akobo in the Upper Nile Province 1920-27. Morton, Chris. "Nuer men in discussion" Southern Sudan Project (in development). 03 Jan. 2006. Pitt Rivers Museum. <http://southernsudan.prm.ox.ac.uk/details/1998.346.349/>.